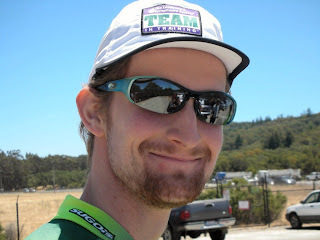 The Ironteam meet at 8am at Edgewood and Canada Rd, to start out the 72 mile ride generally flat ride with a medium grade. We started off heading north on Canada Rd, continuing past 92 on to Skyline which passes by Sawyer Camp, and then turn on Crystal Spring Rd, which has a great downhill as you start into it. The route loop around joining up with Canada Rd using a cycle path which crosses back over the freeway. I had started the ride a little late so the first part of the ride was just playing catch-up, by the time I was passing by our starting point I had reached the front of the pack and was ride with Allen, Al and Jed. 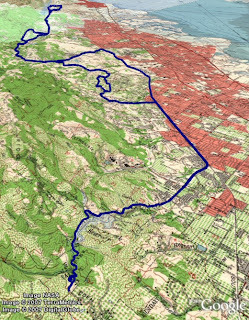 The route then lead us to a couple of hill repeat loops in Los Altos, next on to Foothill Expressway and all the way out to Steven Creek Canyon Rd and up Mount Eden. We took a small rest at the top of Mount Eden and then headed back down, Coach Mike was at the bottom with a Water, Gatorade and most importantly the Pringles (got to get that salt in). The day was heating up the water bottle refills were a necessity, it is at times like this that you realize how great is to have people out there supporting you.